The European Commission’s Digital Single Market Strategy consists of 16 initiatives that will help create a consistent set of rules for digital matters across the EU's 28 Member States. Almost a year has passed since the strategy was first released, but what exactly has been done so far? What are the Institutions currently working on? What are the next steps? In these past 11 months we have seen the European Institutions working hard in order to officially deliver the first proposals within the DSM framework. In response to the Commission’s strategy, the European Parliament (EP) provided an assessment of the strategy by adopting an INI (Own-Initiative) report “Towards a Digital Single Market Act”. Despite the report being non-binding, it offers the EP’s view and sends a strong message to the Commission: make the DSM real, Europe needs it. In a drive to inform themselves by gathering all information and stakeholder insights possible, the European Commission launched 10 public consultations and related processes carried out in 2015 on topics ranging from reform of the regulatory framework of cross-border parcel deliveries to the rules for online platforms and geo-blocking. From this, the European Commission made its first proposal in mid-December on reforms for the supply of digital content, the online sale of goods and the cross-border portability of online content services (which follows up on the reform of roaming charges). 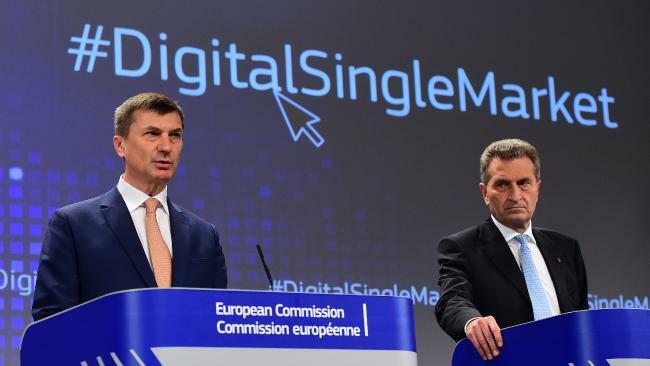 EU Digital Single Market Commissioner Andrus Ansip (L) with EU Digital Economy and Society Commissioner Günther Oettinger (R). While other consulting processes are still ongoing (such as the consultation on copyright, seeking views on the role of publishers in the copyright value chain), the co-legislators (Parliament and Council) are kept busy by the issue of cross-border portability of content and the supply of digital content. It has been argued on one hand, that consumers will be “able to see Netflix from wherever they are”, as Commissioner Ansip (spearheading the DSM strategy) often states; on the other, we are not 100% convinced about the benefits coming from the reform of contract rules applicable when purchasing digital content online. If the proposal gets through as it is, the digital industry will find it difficult to satisfy the different requirements set out and consumers will be hit by higher prices and less consistency of rules. We know that the Dutch Government, holding the Presidency of the Council of the EU until July, and the European Parliament wish to see these two specific pieces of legislation adopted before the summer. Especially given that the debate on new contract rules will get particularly heated, we are seeing a big buzz in Brussels surrounding the proposal. Stay tuned! On the “what to expect now” question, the coming months are shaping up to be very busy, as several further initiatives will be unveiled soon. In addition to the two communications on European Cloud and Digitalisation of EU Industry, the Commission in the last few days has finally released the Public Consultation to kick start the review of the e-Privacy Directive. Why does the e-Privacy Directive need reviewing? Because the current system needs to adapt to work with the new General Data Protection Regulation, built upon a comprehensive foundation of information and stakeholder input. After a thorough review, the Commission is expected to come out with legislative proposals some time in December of this year. June will be all about online intermediaries: in order to reach the end of the long path that started with the so-called Platform consultation in September, the Commission will come up with an official communication on the role of platforms (1 June) and will issue guidelines to Member States (22 June) on how to apply existing EU legislation on sharing-economy-companies and businesses. What are we hoping for? We hope that all of these proposals will improve the digital industry and, above all, create a digitalised Europe with a balanced framework that cares about the users’ needs as well as businesses’ interests. Small businesses and start-ups might thrive, stagnate or fail depending on our policy leaders’ willingness to adopt comprehensive and meaningful reforms which increase funding opportunities and investment as well as expanding opportunities. Great cooperation and attentive listening are crucial. What’s decided now will set the basis for our digital future. We can’t wait to read and respond to the Public consultation on apps and other non-embedded software, expected in the first half of April 2016, as not much has been said about it up to this point.